eSSENCE invites project proposals for postdocs in e-Science at Uppsala University. Last date for application is October 21, 2016. The Department of Computing Science at Umeå University (http://www.cs.umu.se) is seeking outstanding candidates for post-doctoral researcher positions in cloud computing and distributed systems. The last date for application is 2016-10-31. 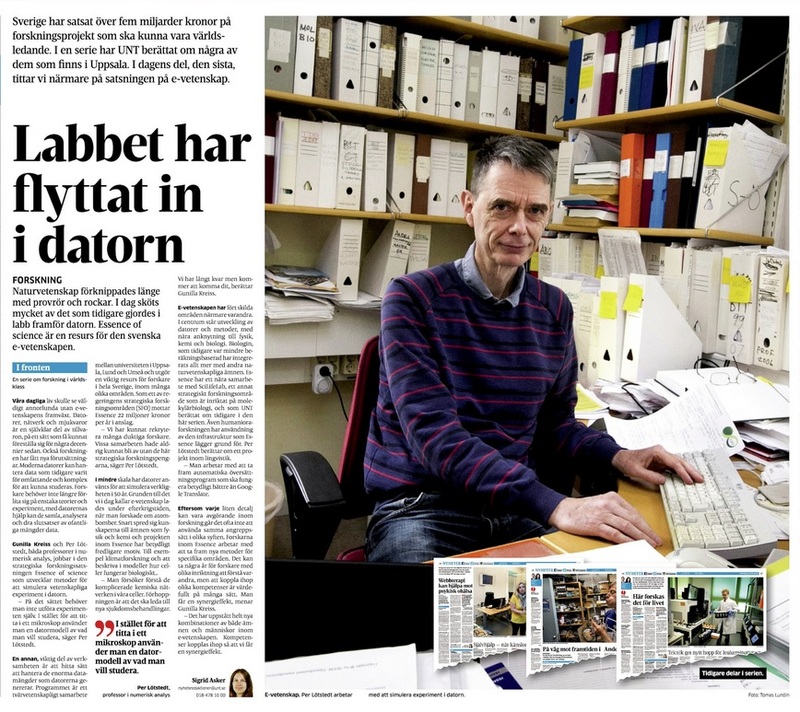 Per Lötstedt, Director of eSSENCE, was interviewed by the Uppsala newspaper, UNT. In an article entitled “The laboratory has moved into the computer” Per took the opportunity of introducing e-Science to the public and describing the eSSENCE research program.The article was published on September 7, 2016 (in Swedish). If you have a subscription you can read the article here. GigaScience, vol. 5, no. 1, pp. 1-9, 2016. With ever-increasing amounts of data being produced by next-generation sequencing (NGS) experiments, the requirements placed on supporting e-infrastructures have grown. In this work, we provide recommendations based on the collective experiences from participants in the EU COST Action SeqAhead for the tasks of data preprocessing, upstream processing, data delivery, and downstream analysis, as well as long-term storage and archiving. We cover demands on computational and storage resources, networks, software stacks, automation of analysis, education, and also discuss emerging trends in the field. E-infrastructures for NGS require substantial effort to set up and maintain over time, and with sequencing technologies and best practices for data analysis evolving rapidly it is important to prioritize both processing capacity and e-infrastructure flexibility when making strategic decisions to support the data analysis demands of tomorrow. Due to increasingly demanding technical requirements we recommend that e-infrastructure development and maintenance be handled by a professional service unit, be it internal or external to the organization, and emphasis should be placed on collaboration between researchers and IT professionals. Department of Computing Science at Umea University, Sweden invites excellent candidates to apply for postdoctoral and PhD positions. The successful candidate(s) will join NLAFET, which is one of the high-profile extreme-scale computing projects funded by the European Commission within the recent FET-HPC call under Horizon 2020. NLAFET is coordinated by Umea University with international partners from INRIA (France), University of Manchester and STFC-RAL (UK). Extreme-Scale Systems” ( http://www.nlafet.eu ). Future extreme-scale supercomputers will be heterogeneous and lead to new and challenging demands for efficient numerical algorithms and parallel software libraries. The aim of NLAFET is to tackle these challenges and ultimately deliver new scalable numerical libraries for fundamental problems in numerical linear algebra, including the solution of dense and sparse systems of equations and eigenvalue problems. Achieving this requires a co-design effort including developing novel algorithms, exploration of advanced scheduling strategies and runtime systems, offline and online autotuning, as well as avoiding communication and synchronization bottlenecks. The positions will focus on design, implementation, and evaluation of parallel algorithms for matrix kernels and eigenvalue problems with regards to the extreme-scale challenges. The research will be done in close collaboration with recognized researchers and PhD students in the research group as well as with other partners in NLAFET. O. Spjuth, J. Hastings, J. Dietrich, J. Heikkinn, N. Pedersen, J. Hottenga, S. Ripatti, P. Burton, I. Fortier, C. van Duijn, E. Wichmann, J. Rung, M. McCarthy, M. Allen, E. Raulo, I. Prokopenko, J. Karvanen, M. Perola, M. Kolz, E. J.C. de Geus, G. Willemsen, P. Magnusson, J-E. Litton, J. Palmgren, M. Krestyaninova, and J. Harris. A wealth of biospecimen samples are stored in modern globally distributed biobanks. Biomedical researchers worldwide need to be able to combine the available resources to improve the power of large-scale studies. A prerequisite for this effort is to be able to search and access phenotypic, clinical and other information about samples that are currently stored at biobanks in an integrated manner. However, privacy issues together with heterogeneous information systems and the lack of agreed-upon vocabularies have made specimen searching across multiple biobanks extremely challenging. We describe three case studies where we have linked samples and sample descriptions in order to facilitate global searching of available samples for research. The use cases include the ENGAGE (European Network for Genetic and Genomic Epidemiology) consortium comprising at least 39 cohorts, the SUMMIT (surrogate markers for micro- and macro-vascular hard endpoints for innovative diabetes tools) consortium and a pilot for data integration between a Swedish clinical health registry and a biobank. We used the Sample avAILability (SAIL) method for data linking: first, created harmonised variables and then annotated and made searchable information on the number of specimens available in individual biobanks for various phenotypic categories. By operating on this categorised availability data we sidestep many obstacles related to privacy that arise when handling real values and show that harmonised and annotated records about data availability across disparate biomedical archives provide a key methodological advance in pre-analysis exchange of information between biobanks, that is, during the project planning phase. In the EU COST Action SeqAhead, researchers lead by eSSENCE researcher Ola Spjuth have conducted a large survey on the use of scientific workflows in data-intensive bioinformatics. High-throughput technologies, such as next-generation sequencing, have turned molecular biology into a data-intensive discipline, requiring bioinformaticians to use high-performance computing resources and carry out data management and analysis tasks on large scale. Workflow systems can be useful to simplify construction of analysis pipelines that automate tasks, support reproducibility and provide measures for fault-tolerance. However, workflow systems can incur significant development and administration overhead so bioinformatics pipelines are often still built without them. We present the experiences with workflows and workflow systems within the bioinformatics community participating in a series of hackathons and workshops of the EU COST action SeqAhead. The organizations are working on similar problems, but we have addressed them with different strategies and solutions. This fragmentation of efforts is inefficient and leads to redundant and incompatible solutions. Based on our experiences we define a set of recommendations for future systems to enable efficient yet simple bioinformatics workflow construction and execution. solution of dense and sparse systems of equations and eigenvalue problems. Achieving this requires a co-design effort including developing novel algorithms, exploration of advanced scheduling strategies and runtime systems, offline and online autotuning, as well as avoiding communication and synchronization bottlenecks. The positions will focus on design, implementation, and evaluation of parallel algorithms for matrix eigenvalue problems with regards to the extreme-scale challenges. The research will be done in close collaboration with recognized researchers and PhD students in the research group as well as with other partners in NLAFET.